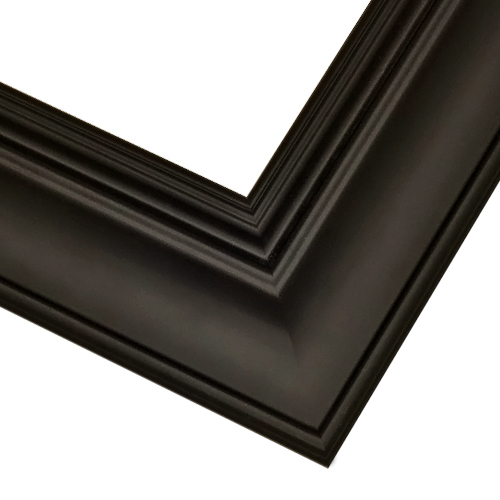 This frame is perfect for traditional and contemporary pieces. 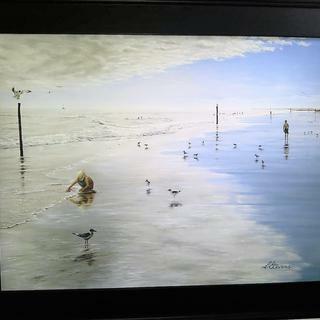 The oil painting wearing this frame is my new "Low Tide" which is perfecting enhanced by this frame pulling all the small black items in the painting together and grounding it. Very pleased with the quality of this frame. Will definitely purchase from this company again. Solid construction and many choices....only wish more frame choices available with linen liner insert. Hello Ann! Thank you so much for your feedback. Great news! You can add a linen liner to any of our Custom Frames. We have limited Ready Made Frame collections with linen liners, however, our Custom Frame Collection is very vast! If you would like us to assist you with finding the perfect frame for your artwork, please reach out to us by phone or email. We can be reached at 1-800-332-8884. Happy Framing! The frame and the picture are perfect. The website is easy to use and ordering was simple. If you are looking for a frame reminiscent of what you would see in Restoration Hardware then look no further. A high quality frame at a very good price compared to a local framing store or even Michaels with a 40-50% off coupon. The only thing that may kill it for some is the over sized shipping charge which brings it from an outstanding value to just good. All in all very happy and would still recommend. Note: Picture uses Heavy-Duty Clear Acrylic as the artwork is very large (50" x 40"). You can see the glare from the sunshine coming from outside so if you have a lot of light, I would recommend going with Anti-Glare Acrylic. Hello Joseph! Thank you for reaching out to us! We appreciate you sharing your framed presentation with us! We wanted to let you know we understand your concerns regarding the oversized carrier fees. We assure you that the oversized fees are not a profit center for us. The fees are imposed by our carrier due to the size of the box that must be used to package larger frames. For future references if you are willing to accept the frame unassembled, we can remove the oversized carrier fee. In order to process that request, we ask that you please call our Customer Care Department. We can be reached at 1-800-332-8884. We totally agree that Non-Glare acrylic is ideal when hanging the artwork in well lit rooms. If you would like to exchange the Clear acrylic for Non-Glare, please let us know. We are willing to email you a UPS Shipping label to exchange the acrylic. Let us know if there is anything else you need. Happy Framing! Heavy duty frame with nice profile. Very solid (if not a bit heavy) build. I like it a lot with the 3/4" natural linen liner. Frame looks very nice. Measurements were perfect. But I dropped it as I was hanging it and the thin plastic shell on top of the wood broke. Since I ordered two I need to reorder another one hoping that they never fall again. Hello Ryan. Thank you for taking the time to give us your feedback. We are happy to hear that you were pleased with the frame's appearance, and the accurate measurements. The overlay on the wood is a gesso finish that we adhere to the wood frame. The hanging wire we send with the frames are able to support frames up to 50lbs, and should be stable on the wall. If you need more guidance on how to hang your frames, please reach out to us at 1-800-332-8884. Happy Framing! 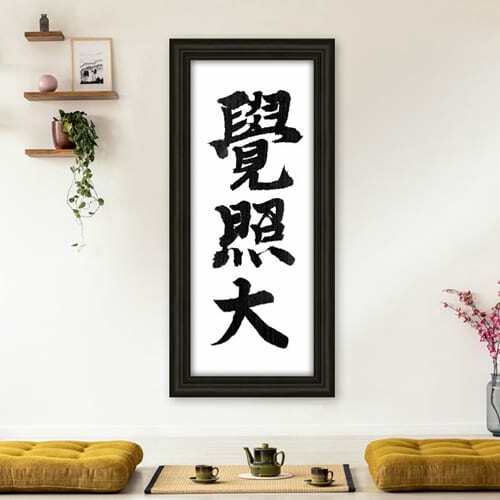 I choose this frame because of the three inch width of the frame and décor. I choose this frame because the thickness of the frame will make the picture I am framing more prominent on the wall I will be hanging it on. It is what I wanted. Classic frame. Goes well with modern art piece. Very happy with style and sizes that I needed. Easy to order! Because it was on sale and it was the color I wanted as well as the fact that it's a wood frame; I prefer wood frames. Can't go wrong with a elegant blank finish. This will go perfect with the tiger painting my niece did for me! Framing a photo of a city at twilight; this item will add elegance without being distracting. The buyer gave me a choice of green or black. The black worked best and this one is a warm black. BEST ANSWER: Hello Lynda! The GLD7 will work with a 1" deep canvas. See the image below. Thanks. Can this frame accomodate a canvas that is 3/4" deep? BEST ANSWER: The depth of the PLC9 frame is 1/2" and this will work with your canvas. The canvas will protrude out the back of the frame slightly by 1/4". We have canvas clips available for purchase that will support the canvas being slightly deeper than the frame. The canvas clip have four per box. The size of the artwork will determine how many canvas clips you might need. My poster is very large (32 x 47). The only non-glare acrylic option is 1/16". That seems thin for a large frame. Will it distort/flex in a frame of my size? this company. Any frame that I have purchased has been excellent for whatever reason. I have sold many paintings with frames I have purchased from I have never had a complaint. I hope your happy with my reply. We buy frames all the time from pictureframes.com, but we don’t like the non-glare. It seems to dull the picture. We have never had a problem with the thickness of the plexiglas. I think it should be okay. It is likely that you would see some flex in a sheet of 1/16" acrylic. We do have heavy duty acrylic that is more suited for those dimensions, it is however not non glare. do frames come with the glass? BEST ANSWER: The frames do not come with glass. We recommend using Clear Acrylic. The acrylic must be added to the order separately. We have different types of acrylic such as non-glare, uv protectant, and premium.